San Marcos Mennonite Church, ca. 1930. San Marcos Mennonite Church, (General Conference Mennonite Church), located at Chimney Rock near Paso Robles, California, was the first Pacific District Conference church to be organized in California. In 1896-97 six Mennonite families from Beatrice, Nebraska settled 10 miles northwest of Paso Robles, including the minister, A. J. Wiebe. During these years another Mennonite settlement was established in the Estrella district, east of Paso Robles, among whom was Jacob Hege, a preacher. In 1897 these two groups, though rather far apart, organized a congregation. Hege was elected elder and Wiebe his assistant. In 1898 the congregation built its first church at Chimney Rock, northwest of Paso Robles. Since the two settlements were so widely separated, and transportation was difficult, it became necessary to establish two meeting places, one group continuing to meet at the new church with Wiebe, while the other group met in an adobe church near Estrella with Hege. Monthly union meetings were conducted in order to maintain the spirit of fellowship between them. In the fall of 1901 John K. Lichti was called to assist Hege at Estrella. In May 1903 a joint council was called at Paso Robles to discuss various problems within the congregation. The discussion became so acute that the congregation was ordered dissolved. The group at Estrella immediately organized as the First Mennonite Church of Paso Robles. The western group organized in 1904, with 39 members, taking the name San Marcos Mennonite Church. F. F. Jantzen was the first elder, with A. J. Wiebe continuing as minister. 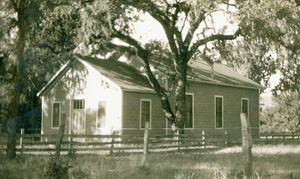 The San Marcos meetinghouse was moved to Willow Creek in 1911, but the congregation continued to be called San Marcos. In 1943 the name was changed to Second Mennonite Church of Paso Robles, and in 1954 to Willow Creek Mennonite Church. 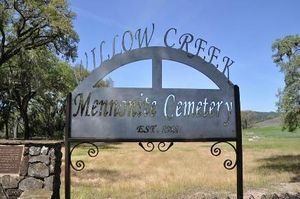 Willow Creek Mennonite Church Cemetery Sign. Source: San Luis Obispo County Genealogical Society website. In January 1967 the Willow Creek Church burned to the ground. Though the church is gone, the Mennonite Cemetery, dating back to 1911, still serves the churches in the area. After the fire, numerous meetings were conducted, and the congregation decided not to rebuild. Representatives from Willow Creek and First Mennonite Church concluded that the two churches would unite. The merger took place with a special service in September 1967. A memorial marker was erected at the site of the Willow Creek Mennonite Church. The bronze plaque on the marker has been engraved with the revered scripture verse which prefaced many of the writings of Menno Simons: "For other foundation can no man lay than that is laid, which is Jesus Christ." I Corinthians 3:11. Burkholder, H.D. The Story of Our Conference and Church. (1951): 37-43. Toevs, Robert and Phyllis Bergman. History of the Mennonites in the Paso Robles Area. 1997. Burkholder, Harold D. and Corinna Siebert Ruth. "San Marcos Mennonite Church (Paso Robles, California, USA)." Global Anabaptist Mennonite Encyclopedia Online. August 2013. Web. 24 Apr 2019. http://gameo.org/index.php?title=San_Marcos_Mennonite_Church_(Paso_Robles,_California,_USA)&oldid=163023. Burkholder, Harold D. and Corinna Siebert Ruth. (August 2013). San Marcos Mennonite Church (Paso Robles, California, USA). Global Anabaptist Mennonite Encyclopedia Online. Retrieved 24 April 2019, from http://gameo.org/index.php?title=San_Marcos_Mennonite_Church_(Paso_Robles,_California,_USA)&oldid=163023. Adapted by permission of Herald Press, Harrisonburg, Virginia, from Mennonite Encyclopedia, Vol. 4, p. 414. All rights reserved. This page was last modified on 13 January 2019, at 18:38.